Of perennial concern to staff and students is the safety of those going about their business at Tech. 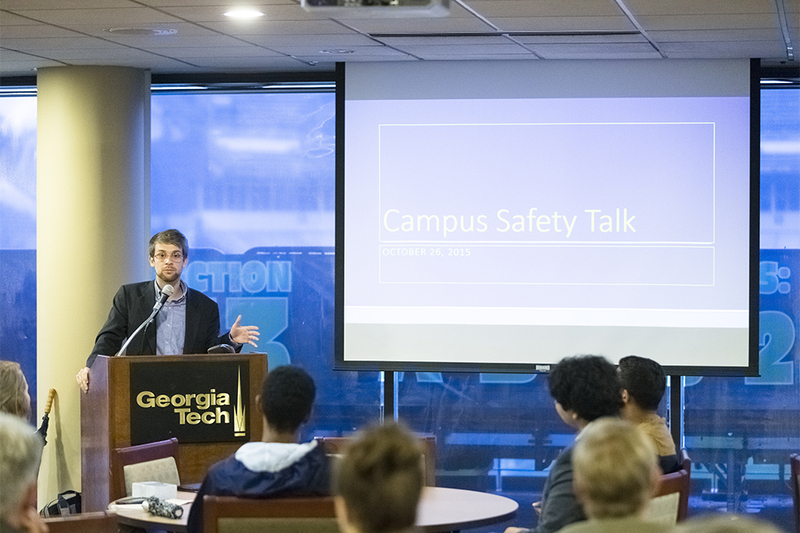 This past Monday, those concerns were addressed openly in an effort to create fruitful dialogue at the Georgia Tech Campus Safety Talk. The talk provided an open forum for anyone who wished to ask questions or bring up concerns on the topic of safety. Present at the talk were a number of senior representatives of safety groups available to answer questions. Christ Leighty, the public safety director for Midtown Atlanta, talked about safety in Midtown, which is important to students because of its close proximity, just east of campus. He gave a number of tips for students, such as keeping one earbud out when listening to music to increase situational awareness as well as not talking on the phone while walking for the same reason. He also advocated hiding personal belongings such as bookbags and purses in cars to help prevent break-ins. Officer Connelly of the GTPD was also present to answer questions and take note of the concerns of attendees. Student representatives of various groups also spoke about issues on behalf of students. Alex Grady, who represented athletes on campus, pointed out that athletes were often placed at risk because of travel to and from practice either very early in the morning or late at night. He pointed out the lack of a bus option that could transport students, as well as the fact that athletes with vehicles have to choose between parking near practice and parking at their own dormitories. Problems faced related to Greek life were also addressed by Melissa Holmes, president of the Panhellenic Council. She explained that the large amount of late night foot traffic in and around Greek housing called for adequate lighting for back alleys, which is not always provided. Besides safety from robbery and assault, another concern was traffic safety. Participants brought up problems such as confusion over the HAWK signal on North Avenue near the alumni house as contributing to an increased risk to pedestrians. Another issue addressed was the suitability of crosswalks for individuals with disabilities, given the lack of sufficient time for some to cross as well as the lack of audible signals to cross for the visually impaired. The talk was initially meant to be the Georgia Tech Safety Walk but was moved indoors due do the weather. The walk is an annual discussion that allows for a tour of areas of campus at the same time that potential issues surrounding those areas are discussed. In the past, suggestions from the safety walk have affected the implementation of campus development. For example, the creation of the pedestrian-only road running between the Petit Biotechnology Building and the Marcus Nanotechnology Building was a result of the walk, as was the increased presence of blue light emergency phones. Thanks to the these events, the administration is able to hear the voice of those intimately familiar with campus safety concerns and prioritize their projects based on those concerns.